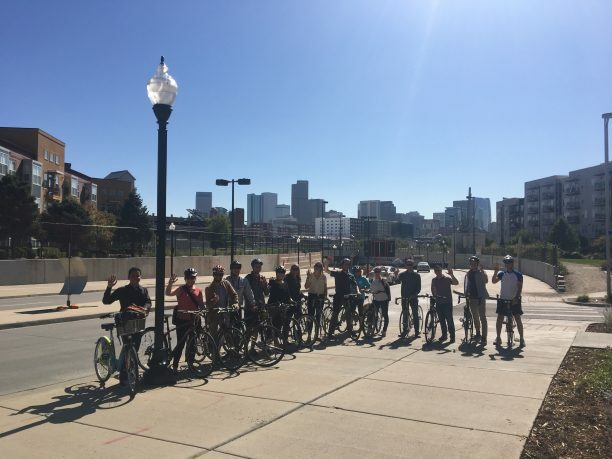 It all started with a simple comment during a lunch meeting a few months ago, “you know what would be fun…” and from there turned into a great afternoon with AEC industry folks touring Denver’s LoDo (lower downtown) and RiNo neighborhoods on bikes! The afternoon provided a change of pace, a change of perspective and the opportunity to get out from behind a computer to connect with like-minded friends. What a beautiful day for a bike ride! Stops along the way included the Alliance Center, TAXI Community, the Ramble Hotel, AE Design and Associates 3 offices. Special thanks to AE Design, CCY Architects and USGBC Colorado for helping plan and execute the details for the day. We look forward to the next adventure!